Combine a crunchy oat-nut crust, cream cheese in the filling and sweet crumbs for Pumpkin Pie Bars on a new level. 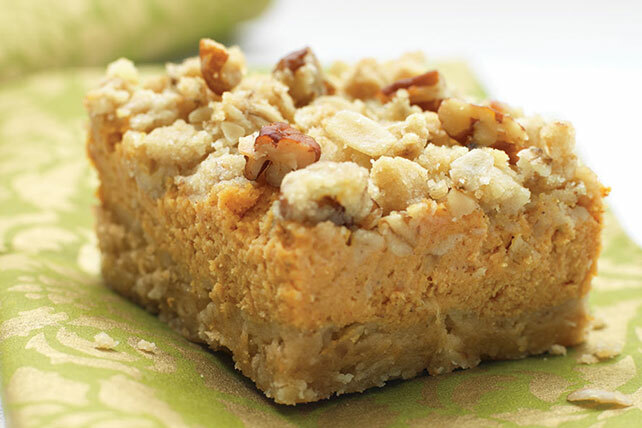 Pumpkin Pie Bars are great for potlucks. Line 13x9-inch pan with Reynolds Wrap® Aluminum Foil, with ends of foil extending over sides; spray with cooking spray. Mix flour, 1/4 cup granulated sugar and brown sugar in medium bowl until blended; cut in butter with pastry blender or 2 knives until mixture resembles coarse crumbs. Stir in oats and nuts. Reserve 1 cup oat mixture; press remaining onto bottom of prepared pan. Bake 15 min. Beat cream cheese, remaining sugar, eggs, pumpkin and spice with mixer until blended; pour over crust. Sprinkle with reserved oat mixture.